"A monster of a reissue -- by a long way the rarest item in Mikamis discography, a fanclub-only DLP released in an edition of 100. These are the very earliest recordings by surrealist folk legend Mikami, captured on tape in 1970 at the legendary Shibuya underground club and hangout, Station 70. The club used to host regular sessions by free-jazz heroes like Motoharu Yoshizawa and Kaoru Abe, while the cream of the citys avant-garde community rubbed shoulders with Japanese Red Army terrorists and Yukio Mishimas private army. Thrust into this ferment comes a nineteen year-old police academy dropout from the far north of Japan, armed with nothing but his guitar and a satchel full of coruscating, carnal songs of anger, lust and hate. This reissue isnt going to stick around for long either -- an edition of 777 copies, in a special card digipack." -- Alan Cummings. "A long-circulated set of intense early recordings from Mikami. "Kan Mikamis 1972 Kochi University Live has long circulated in fan circles and is whispered to be one of the most powerful dates the bald colossus ever played. Captured live at Kochi University in front of a crowd of hyped-up wannabe student revolutionaries, Mikami breathes raging white-heat into a set of lurid, rabble-rousing classics. Stunning cover painting by Kazuki Tomokawa. Special card jacket, limited edition of 1000." - Mikami Komuten. "Hoi (Addendum) is another long-rumoured record that at last sees the light of day. It was originally scheduled to have been released by Mikamis fanclub as a follow-up to the 19 years 2 months 16th night DLP, but the project was shelved at the last minute. Now, ten years down the line, the world finally gets to hear this wonderful trawl through Mikamis deepest archives. Eighteen tracks, all previously unreleased, comprising live versions, outtakes and much more. Special card jacket, limited edition of 1000." - Mikami Komuten. "The new Mikami album (previously available as part of the massive PSF 13CD box set (PSF 110/122)." 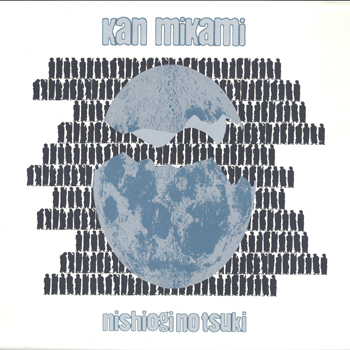 "Twelfth solo album from Kan Mikami in as many years -- and, seemingly, the last in this monumental series. Mikami is Japans undisputed, one and only voice of urban folk surrealism. 1979 presents few surprises for the converted -- tightly gripped clusters of electric A-minor riffing, weird phrasing, and those unmistakable honey-over-broken-glass vocals. Even better than usual are Mikamis bizarre and incisive ruminations on the state of modern Japan (megaliths in the garden, a Gibson guitar hang from the rafters of a rural shrine, the return of Elvis, sake-guzzling crabs and the resurrection of the dead). As a poet-analyst of middle-aged male frustrations and everyday epiphanies in the toilet, Mikami has no equal (well, maybe Richard Meltzer). Comes with full English translations of the lyrics and linernotes." - Alan Cummings. "Two new heavy-hitting blasts from Japans indefatigable master of the psychedelic, surrealist blues. After a recent European tour and an hour-long special on Japanese television, the wonderfully titled Barking Practice /// White Lines finds Kan Mikami back in the studio in one-take guitar and vocal mode. Theres a depth of song spirit on display here that beggars belief -- the guitar bites in all the right place, and Mikamis voice is tuned to a new pitch of hard-won soulfulness, in turns bristle-harsh, lush, fractured, deep as all hell. Staggering work. Includes English lyrics and some fabulously atmospheric photos by Paolo Patrizi." - FE. "Great guitar/vocal acoustic zoner folk from this legend, his first release on the label. Solo studio performances." - FE. "Fifth album for the label, and another astounding visionary triumph for the emotionally bursting singer/guitarist. The second track here, where Mikami enunciates just one word over and over, is one of the most spirally, physically stroked tracks in the extensive PSF catalog (were only talking about the worlds most aesthetically perfect record label). "Mikami is the blues; pure uncut humanity and universal force that dont need no words ? you going to tell me you didnt understand a single word of Blind Willie Johnsons Dark Was the Night, or Loren Mazzacanes early moaning, or even Aylers soul scream? Mikamis got a voice, a soul, and a guitar and you should be able to deal with those." - Alan Cummings. Comes with English notes and lyric translations. "Trademark rough, distorted folk-esque material that stands outside parameters of time/space. Second release on the label." - FE. "For the past twelve years, the coming of spring has also heralded a new Kan Mikami album. Lesbos, his 11th solo album for the label, is yet another step into that same everflowing river of truth that Mikami has been bathing in for over thirty years. The format is unchanging -- rough and abstractly percussive electric guitar accompaniment, a voice capable of a delicate caress, a wistful cajoling, or flesh-stripping ferocity, and songs of arcane wisdom as personal and poetically impenetrable as anything Jandek has ever laid down. This time out the topics include the mystery of Michael Jordan, the rain in Rome, and cans of pineapple chunks. Just like Heraclituss river, Mikamis world defines it eternity through constant flux. Isnt it about time you stepped up and got your feet wet?" -- Alan Cummings. "Fourth release of intense guitar/vocal exorcism for PSF. From Alan Cummings liner notes: "Haino Keiji has said that Mikami is the only person he trusts to sing in his place."" - FE. His 3rd for PSF. "Kan has perfected a form he calls Japanese Blues, but every album he has made over the past 20 years has raised it to a new height of creative intensity... regulars come back year after year to hear songs that are raucous, splendiferous, surreal, Japan Itself, both image and critique. The words are sometimes soft, as limp and multidimensional as Dali watches, other times razor sharp, slicing through the screen of conventional morality. And the triumphant voice! Like gravel scratching on a riverbed, a crow and then an eagle, screaming out of range, then soft and mellow, silky and sublime. Theres nothing like it in Japan. And theres no rival to Mikami Kan anywhere else, either." - Drew Stroud. "Seven tracks of twisted enka blues, from the immortal Kan Mikami, Japans king of the surrealist aside and situationist duckwalk. These latest seven missives from Mikamis febrile imagination sketch out a concern with the passing of time, with the inexorable processes of aging, and the losses and gains of Japans modernity. Present and correct are the masters unique sense of expanding and contracting rhythm, his trademark jaggedly beautiful riffing, and that glorious, honeyed howl of a voice. Making a special guest appearance this time round is Korean folk singer Kim Doo Soo, contributing spectral blues harp on one track. Seven tracks, 32 minutes. Booklet includes lyrics in English and Japanese." -- Alan Cummings. 2009 release, out of print. "New solo studio recording by Japans reigning surrealist blues poet. Forty plus minutes of all new material recorded in France during Mikamis 2008 European tour. Numbered heavy weight vinyl only edition of 333 in handpulled screen printed sleeves. Includes lyrics in Japanese and English (title track alone is a trip through painted omelets and the moon to a rusty French bicycle). While Mikami is building up a massive body of work through his long running association with PSF records this is the first of his studio dates to be committed to vinyl in decades. Singular and essential." -Siwa. "Universal songs. Beyond language and meaning stands the blues. Not the one the GIs brought with their pack in Japan, but Kan Mikamis own vision seen through the prism of enka music. Such songs we cannot find in popular music nowadays. The blues, its spirit and its agonizing mood comparable to the Portuguese fado. Black songs, free form songs, with their beauty and violence, rudimentary electric enka ill-treated Blues tore to pieces. We could almost hear Blind Willie Johnsons ghost activating the guitar and the voice. Kan Mikami strums his guitar with violence and sensuality, telling stories hardly ever told in Japanese songs, at the edge of black humor, surrealism and Dada. And his voice is unique, nearing violence, screams and a sticky melancholy. Bachi was recorded by François Dietz at the end of Kan Mikami French tour at studio CCAM in Vandoeuvre-lès-Nancy. Nine songs where the voice bears new inflexions never heard on his previous recordings, maybe close to an exotic folklore as dreamt by our western imagination. Sombre and moving Chants skinned by his harsh voice, with guitar on the background, haunting lavish blues." - Turtles Dream.